Finished Object: Wham Bam Thank You Lamb! Over the holidays I knit a ton of small projects, including cowls, neck warmers, and several pairs of Toast mitts, all of which I’ll blog about. This neck warmer is the most functional of the bunch, and my new favorite. I cast on 35 sts. instead of 25 and knit until the yarn ran out. I did a provisional cast on and when I got to almost the end of the yarn, cast off 20 or so sts., grafted the rest together, then cast off the remaining sts. No pesky seam. :) Don’t forget to have the last row of stitches on the top needle be knits and the bottom row (last knit) have purls up against the needle when you graft in garter. It’s been shipped. This is a newish fiber, which I don’t sell in the shop, but will right away. It’s great stuff! It’s good to be the dyer (spoiler). The fiber club has gotten so big that my formerly little bag of fiber tails has grown to a 2 lb. 10 oz. bag of tails this time. I was planning on making Mr. HelloYarn a vest (he’s been alternating his two knitted vests every other day, the poor sausage), but cripes, I can make a vest and a sweater from this haul! Maybe matching Adrian, Mark, and Pippa sweaters? yes, I sobbed all through the Wire, but it’s worth it!!! I peeked at fiberclub! Eek, that looks awesome. Look out because season 4 of The Wire is knock your socks off amazing. 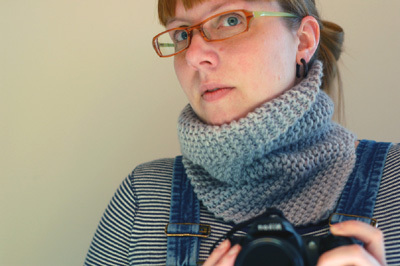 for some reason i have yet to knit a cowl, but this one really appeals to me. your blue version is quite pretty! i love your slight mods, too. OMG I watched Seasons 4 & 5 over vacation and your jaw will drop. Of all the seasons, #4 is my favorite, but the end definitely won’t disappoint. oh fun and squishy cowl! i hate grafting and seaming in garter stitch, though. i can never get the hang of it! Okay, so wait, you weren’t a Malabrigo user before? I can’t even imagine such a thing. Was your life cold and empty? YES you will totally cry. I had someone tell me that season two and three of Deadwood were such a downer they almost wished they would have stopped watching. I am in the middle of season one I hope that she was wrong. The last season of the Wire is more of a letdown – not quite as good as the others, but I still cried at the end. They have an amazing last episode. Love the cowl. It looks so squishy and soft. Love the cowl! Great colour. Oh, yum. Malabrigo is indeed lovely. Yes please to matching sweaters all around! Also, stellar cowl! Hmm. Now I can’t remember the end of the wire. I loved Omar. We’re watching Deadwood now and really enjoying it! 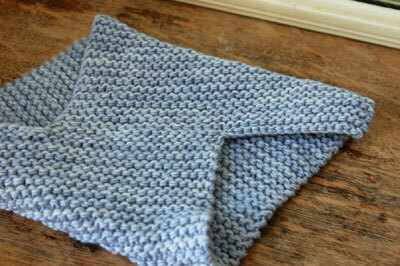 The cowl is lovely! Man, I gotta make me one of those! That looks like such a scrumptious neckwarmer. The color is fantastic. Thanks, now I’m going to have to look that up for my Netflicks. I’m always looking to add to my queue! you will look darling in matching vests or sweaters!!!! the cowl is very very nice. i have some malabrigo somewhere. maybe i should knit one. and the name is maybe the best. The Wire is the BEST. Oh, and I like the cowl too! I’m not peeking… I’m going to be good and wait until my fibre gets here in below freezing Germany.. and I think matching sweaters for you guys is a fab idea! Oh yes, “The Wire.” My husband stopped watching after season 1 because it made him sad. I made it all the way.. though cried a lot. When you’re done with that, I recommend “The Boys of Baraka,” a PBS documentary about Baltimore boys going to a boarding school in Kenya. looks so snuggly warm! I must make one for myself. I knit so much for other people in December its time for me to be selfish right? (even if I still have gifts to finish..) Matching sweaters would be fantastic.